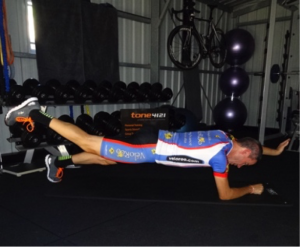 Tues Cycling (5 mins fairly hard) with 2 min recovery in between. 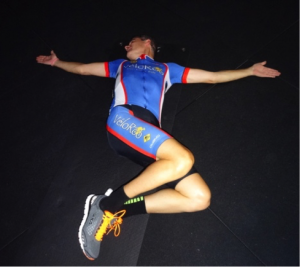 Lie down straight, legs extended and arms above your head. Lift your arms and legs towards each other at the same time as straight as you can then lower back down. Repeat for 3 sets of 10 repetitions. Too Easy? Hold the V position for 1-2 seconds before lowering the arms and legs. Too hard? Lift your arms to your legs & hold them at the top. 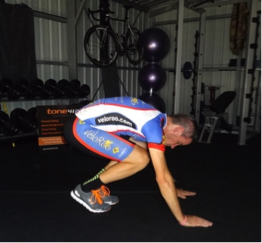 From a standing position, drop into a squat with your hands on the ground. 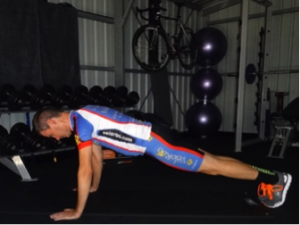 Jump your feet back to a plank position then back to the squat position and jump up to standing. As you jump up, jump sideways to your left over a mat. 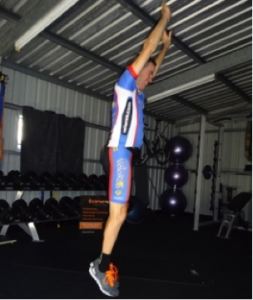 Do another burpee, this time jumping sideways to your right. Do as many burpees as you can alternating sides for 45 seconds and repeat for 3 sets. Too easy? Add a press-up from the plank position. Too hard? 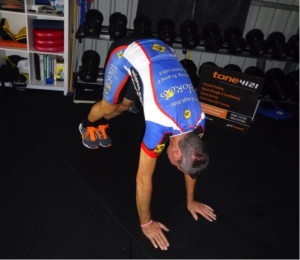 Remove the lateral jump with a straight burpee. 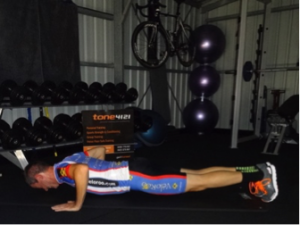 Complete a full push up and as you push up to the top, push into a side plank and hold then come back into a push up, and push up to the other side, the harder you push up the harder your core has to work. Repeat 3 – 5 times each side. Too easy? Push up harder and faster. Too hard? Just stick with the press ups. 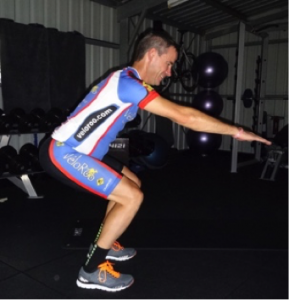 Hold a squat with parallel thighs with strong posture for 5 seconds. Then jump up, landing with bent knees at the bottom of the squat. Repeat 3 times for 1min. Too easy? Hold the squat for 10 seconds then jump. Too hard? Do 15 seconds of squat jumps, 15 seconds hold, and repeat. 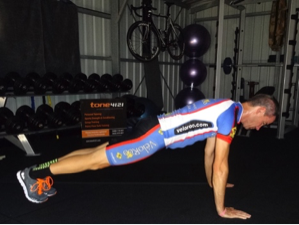 In a plank position on your forearms, lift opposite hand and leg off floor whist maintaining a strong straight core – keep your hips down, steady yourself then change. Too easy? Hold for 10 seconds in each position. Too hard? Lift one limb off floor at a time. 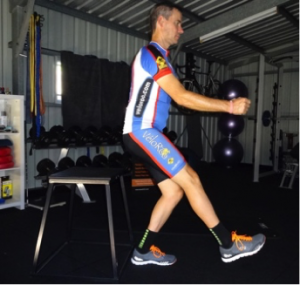 Standing on one leg, lower yourself onto a bench and then push back up again through the heel. Try not to collapse onto the bench; touch down lightly and then push up. Keep your heel pushed into the ground and your core muscles engaged. Repeat for 3 sets of 10 repetitions each leg. Too easy? Do the squats free standing without a bench, or use a lower bench. Too hard? Lower yourself down on one leg and stand up. Stretching post-exercise while muscles are still warm is the best time. Stretches can help increase flexibility, decrease the risk of injury and they are great!! Don’t be shy, get your stretchy time happening after any exercise! A pole is optional for balance. Hold each stretch for 30 seconds, switch sides. Enjoying it too much? It’s OK to repeat!! 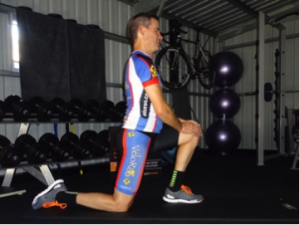 On one knee, drop forward towards the front knee. 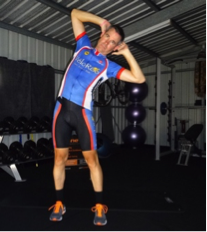 The idea is to stretch the quad and hip flexor: relax the hips as much as possible to allow this to happen. It may also help to reach the arm of the leg you’re stretching up and over your head. Hold for 15-20 seconds and switch sides. Lying on your front, grab hold of one ankle and squeeze the hip into the ground, lifting the knee off if you want to add more stretch. If you can’t reach your foot use a towel looped around to hold on to it. Lie on your back, with knees bent and feet flat on the floor. Stretch both arms outwards along the floor and slowly drop your knees to one side, taking the head in the opposite direction. Breathe into the stretch to release all tension from the back and neck and only take your knees as far as you can before the shoulders start pulling off the ground. Rotate slowly to the opposite side and repeat for 8-10 rotations. An all-in-one stretch for the whole back line of the body. Push through the shoulders so your bottom is pushed back, creating an inverted “V” shape and the stretch can be felt through the back and hamstrings. Keep your hips high and your heels pushed down. Hold for 5-10 seconds and repeat 2-3 times. 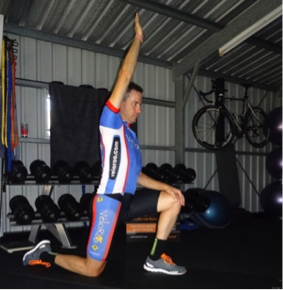 Slowly lean forward over your front leg, but keep your back knee straight and your heel flat on the floor. 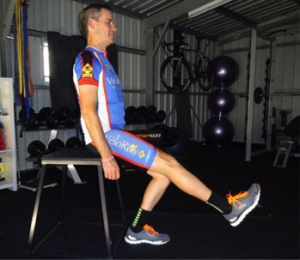 You should feel this stretch in the big muscle of your calf (gastrocnemius). 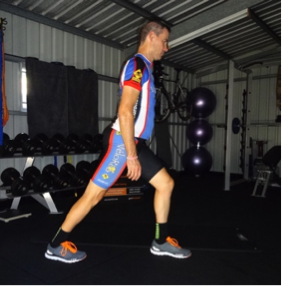 If you then bend your back knee slightly (keeping the foot flat on the floor) the stretch should be felt lower down your calf (soleus). With arms overhead, hold the elbow of one arm with the hand of the arm. Keeping the knees slightly bent, gently pull your elbow behind your head as you bend from your hips to the side. 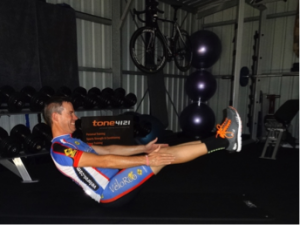 Hold this controlled tension for 4 to 5 seconds and release. To stretch out the hamstring – either use a towel or your hands to hold the leg in position – under stretch but not so tight that it’s shaking. 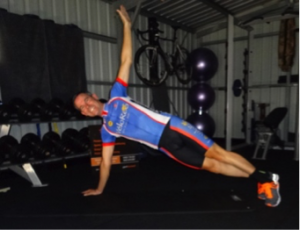 Your upper body should remain on the floor with your head and chest relaxed.